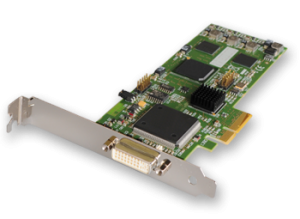 The VisionRGB-E1S captures the Analog/DVI data and triple buffers it into onboard storage. This data is then copied using DMA to the host system for display, storage or streaming. The VisionRGB-E1S is an ideal solution for applications that require the capture of analog or DVI sources in real time. Typical applications include: Viewing analog or DVI sources from PCs, MACs, Industrial/medical equipment, cameras and other video equipment Streaming video applications and video wall controllers. The VisionRGB-E1S video capture card is supplied with a powerful software application for configuring the timing and format of the input sources and displaying the data. Simply connect your external DVI or Analog source into the card, run the VisionRGB-E1S application to automatically detect the video source format and display the captured video in a window on your desktop.